a little small deer, not only inhabit the Kerama. Habitat also Aka, Geruma and Yakabi population only of uninhabited island is small and has been designated as a national natural monument. Originally those were transferred to Kubashima ago 300 years from now the stomach Japan deer in Satsuma is, it is said that I used to wild. Kerama Mashika but seems to hiding in the deep forest during the day, you can see so come down to the village at night. Kerama Deer is said to be living in the most southern area in Japan. It was imported from Kagoshima Prefecture 360 years ago. Kerama Deer is also said to be a variety of Japanese Deer. It is as small as about 75 kilograms weight. The hair is dark, and only bucks have horns although they are shorter than those of Japanese deer. The horns come off from March to April. 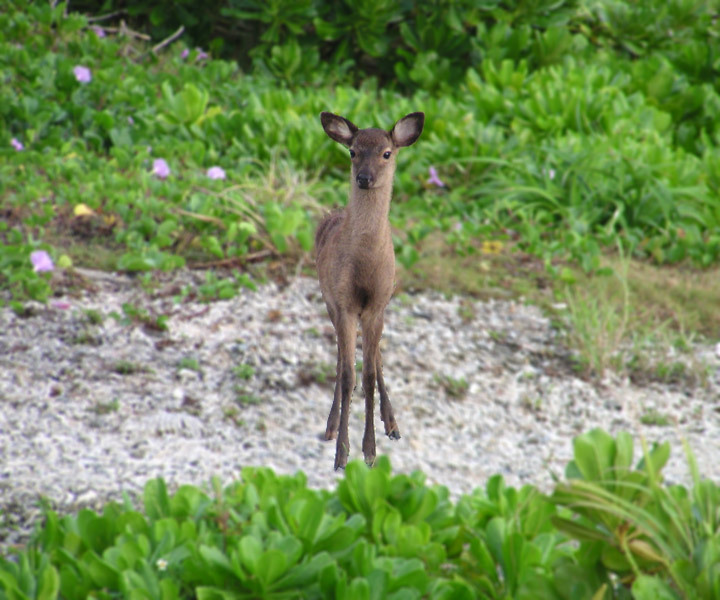 Once a large number of Kerama deer were distributed in Kerama Islands, now they are protected because many of them were hunted because of they destroyed crops.